A broad range of new features are awaiting you. Discover the latest advanced functions in the 6.1 version of our software. You now have the possibility to integrate easily video content into your newsletters with Mailify Sunrise. Thanks to a new type of content available in the EmailBuilder, you can enrich your campaigns in a couple clicks. For this purpose, slide-place the video and enter the video’s host URL. An animated gif will automatically be created, you will have the possibility to personalize the duration, choose when it starts and pick a player button. Simple to use and much requested, this feature will make your emailing campaigns even more engaging! Keep your contact lists perfectly updated! With Mailify Sunrise, you can quickly import your contact lists thanks to the FTP connector we now provide. Therefore, you can drop contact lists with the following formats: .txt, .xlsx, .csv. Mailify will automatically create a contact list in your contact list menu. Automatically synchronize and import your contacts and customers data from your SQL database, and Mailify will create a contact list accordingly. Small tip: if you constantly update this file on your FTP server or your CRM, Mailify will provide you a programing feature that allows you to refresh your contact list regularly (hourly, daily, weekly or monthly syncs). You loved it in Mailfy desktop, it is now available in the new version of your emailing software: the integrated eyedropper! 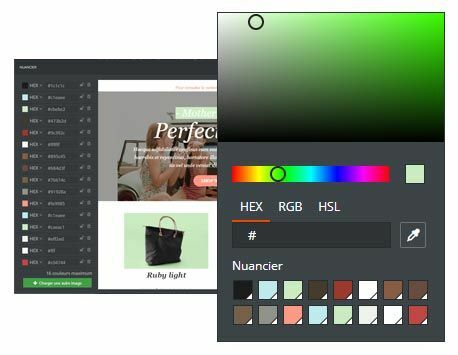 Perfect to choose the most appropriate colors for your emailing campaigns. With this feature, no more newsletters with thousands of colors. You can now select colors directly from your visual supports. Useful, isn’t it? Another tip: Your favorite colors can be saved in a personalized color chart. Use them with your next creations and save time when preparing newsletters. Our emailing software allows you to create newsletters that are 100% mobile-friendly. Thanks to the mobile/computer preview you have an overview of your campaigns on both devices. You can also choose to display, or hide content depending on the device each recipient will use and then optimize the reading experience. You can also adapt your content to the reading mode of your subscribers: make it shorter for a quick reading on a mobile device or include more content on bigger screens for a thorough reading. Use Mailify, our emailing solution and send more efficient newsletters with a 100% responsive design. 2 Keep your contact lists perfectly updated!